You have a Hydra: a grand, ambitious project you’ve always wanted to tackle. It feels overwhelming, unconquerable. Chop off one of a Hydra’s heads, and two more grow in its place. How will you ever defeat such a terrifying monstrosity – and live to tell the tale? In this illuminating fable, productivity expert Josh Kaufman explores the uncertainty and fear inherent in facing down any ambitious challenge, from starting a new business to completing a work of art. The risks involved can never be eliminated, but they can be understood, anticipated, and mitigated. Armed with an adventurer's insights into tackling unknown and fearsome challenges, you can tame a project of epic proportions. 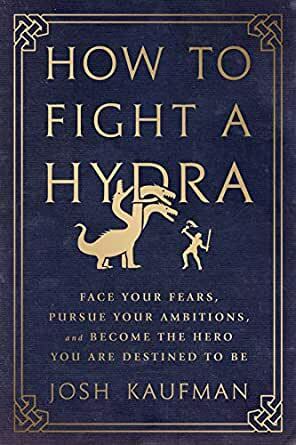 How to Fight a Hydra is an essential handbook for artists, creative professionals, and entrepreneurs tired of ignoring the call to adventure. So prepare for battle, brave soul. Draw your sword. Light your torch. In the darkness ahead, your Hydra awaits. 5.0 out of 5 starsBeautiful, Inspiring. A call to arms! If you're a fan of Steven Pressfield's work such as The War of Art, Turning Pro and Do the Work, you'll love this little gem. I finished it in two sittings, while commuting home after work and in bed before going to sleep. A simple, yet inspiring read that'll have you rethinking that big project you've been afraid of taking on. It's a well written story that parallels the life, concerns and battles of the modern adventurer (the entrepreneur). For the short investment it pays back easily with inspiration and imagery to call upon to inspire us through our next fight. 5.0 out of 5 starsCan all modern business books be like this please? I heard a friend describe this as a fairy tale for the entrepreneur's journey and I was then immediately adding it to my kindle. I kept that idea in my head as I read it and I couldn't agree more. But to describe it as only that would be a major disservice to this book. What I took away from the book was a sense of the scope of my own journey, not just of my business journeys, but all of my unknown futures. It's calming to see the full picture of your journey while you yourself are still in the depths of the unknown. This book will have a permanent place in my library of books to return to. Also, I love that it's designed to be read in one sitting--in an hour. It's nice because I'm a dad and it's hard to return to long books as often as I would like. But more than that, it's nice because one of its values is helping you see the big picture amongst the daily struggles of the adventure. So to be able to grasp the whole book, and thus the whole adventure, in one sitting not only helps you identify your spot in the adventure, but to also see the finish line from where you're standing. I got the audiobook as well--because I want to listen with my kids on our frequent cross-state drives--and the sounds, pacing, and narration are excellent. 5.0 out of 5 stars5 Stars for the cover and title alone. Also a darn good (and quick) read! Josh presents this book on personal development as a parable/fable to learn from, and I think this direction certainly makes it stand out amidst the noise of an overpopulated 'self-help' genre. I could see myself in the narrator, except facing work deadlines or big life decisions instead of multi-headed beasts (though I'm not sure which is scarier). It acts and reads like a book discovered in a dusty used book store, waiting to be be shared from friend to friend, when one of those friends is in need of guidance. As a huge fantasy fan and even bigger fan of Joseph's Campbell's "The Hero's Journey," I couldn't help but smile going through the story and seeing how it was applied to challenges that are applicable to modern times and day-to-day life. I have the kindle version, though I'm considering picking up the paperback version to keep on my shelf because I really do love this cover and title. Though, an embossed hardcover version with gold trimmed pages wouldn't hurt either (wink wink, nudge nudge, Josh). I've read all of Josh Kaufman's books to date - and also had the chance to interact with him a few years back. The Personal MBA is genius and the First 20 Hours changed my life. They are both really good books that I would recommend to anyone. But How to Fight a Hydra is better. I didn't expect much from it, to be honest (though I should have known better, knowing Kaufman's high standards for quality and his extreme thoughtfulness). I was blown away. The first time I read it, it was powerful. The second time, listening on audible, was incredible. I had a long car ride so heard the whole thing in one sitting. Kaufman has narrated all of his own audiobooks - and for good reason. As a CEO and co-founder of a tech startup, nothing I could have possibly read (and I read a LOT of books) could have helped me more than the allegorical fiction masterpiece Kaufman created here. There are so many valuable lessons it is hard to know where to start. I'll mention one in particular, but it is by far not the only one. As a Renaissance Soul (which Kaufman also is, as described in the First 20 Hours), the metaphor of being able to slay a hydra one head at a time was critical and entered my consciousness in a way that no amount of rational hammering has been able to do. For years, I have struggled with picking what to focus on and not getting distracted by the shiny object syndrome. I knew about this problem, I was aware of it, but still, I struggled to shake it. Years of meditating made very little dent into this issue. In fact, over years of effort, I made only slight inroads into this problem beyond the original a-ha moments when reading the Renaissance Soul by Margaret Lobenstine (for which I am eternally grateful to Kaufman, who mentioned this incredibly wonderful book in The First 20 Hours). No longer. Within weeks of my first reading, and days of listening on the audiobook, I find my ability to consciously evaluate where to direct my attention has improved greatly. I pinned up a note on my computer monitor: "How do you slay a hydra? One head at a time." I catch myself drifting off to tangents that are not helping my main goals. The power of metaphor is incredible. I now may have to go read Lakoff's book on metaphors, which Kaufman refers to in the author's note. Beyond the ability to focus, the implicit and explicit lessons of courage, determination, perseverance; planning and practice; the value of showing up; and knowing when not to embark on a journey, will stay with me long after this current venture I'm on. I can already see that this will be a book to reread and take heart from whenever I struggle. If you're hesitant about whether to buy this book, don't. Take your first step towards being the hero of your own story. You will not regret it.